The preps at Bondi are still on their way and the pix are amazing, thanks to Max O’Rourke who covers the event for isTia. One black spot though, the blue bowl was tagged overnight but will be repainted tonight. Whoever did this stupidity does not really merit respect, even if I’m pretty sure they don’t care about what the whole skate community is thinking about them. Although tagging is ultimately an art form and should be respected, when well done, tagging a new repainted bowl one day before an international contest is not a proof of intelligence and does not help skateboarding to be respected by others… But the tags are ugly anyway. On top of being stupid, those guys are untalented. 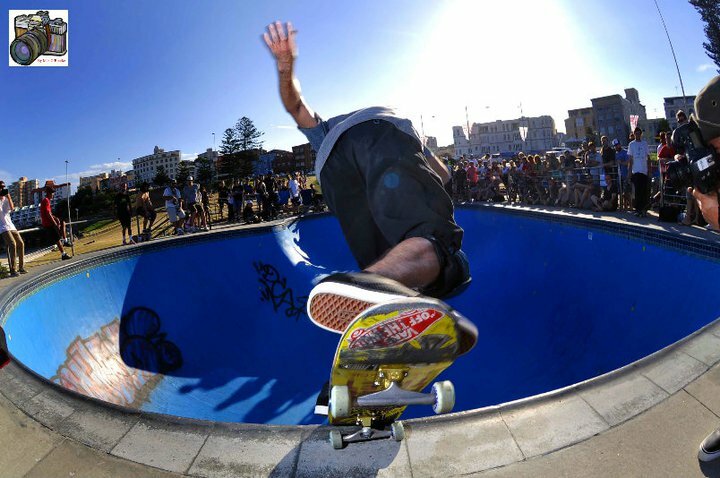 Are you prepared to see the 7th Annual Vans Bowl-A-Rama take over Bondi Beach, Australia with riders such as Steve Caballero, Pedro Barros, Bucky Lasek, Jeff Grosso and more compete for cold hard cash and bragging rights? The madness is live via webcast tomorrow, Friday, February 18th at 4pm PST and 7pm EST. In the meantime, take a look at a couple of pictures from today’s sick practice. All pictures from Max O’Rourke. 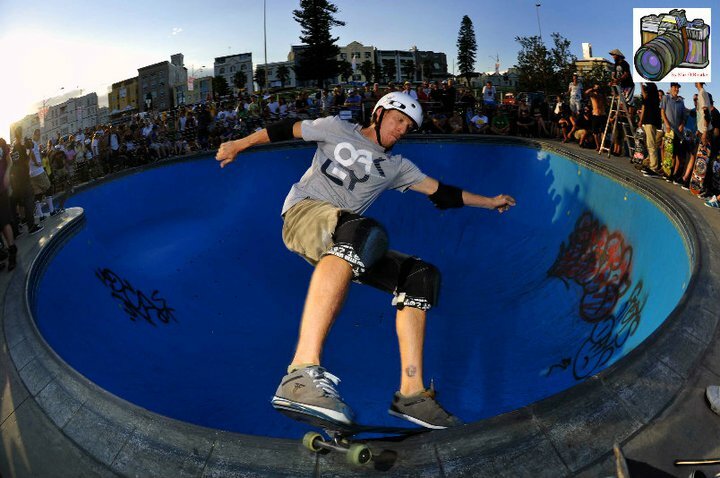 The 2011 Vans Bowl-A-Rama will bring with it the most legendary skateboarders of our time including: Steve Caballero, Pedro Barros, Bucky Lasek, Omar Hassan, Bob Burnquist, Rune Glifberg, Sam Beckett, Pat Ngoho, Otavio Neto, Jackson Pilz, Juergen Horwarth, Renton Miller, Jeff ‘Skunk’ Williams, Tony Trujillo (rumored), Curren Caples and Australian golden boy Corbin Harris. Here, Bucky Lasek. Photo Max O'Rourke. For the first time ever, Vans Bowl-A-Rama will be broadcast live online and via television, enabling both Australian and International fans to experience the excitement and atmosphere regardless of their physical location. The broadcast will also include a range of live interviews with infamous skaters like; Bucky Lasek, Steve Caballero and last year’s teenage runaway triumph Pedro Barros pictured here by Max O'Rourke. The tags do nothing to the bowl, which you might notice is already skuffed from wheels, and do nothing to the public perception of skateboarding. You sound like the guy who freaked out about the kids waxing the curb in front of his house.